Joshua Wong Chi-fung hasn't been afraid to stand up for his convictions, but today he, along with Alex Chow Yong-kang and former legislator Nathan Law Kwun-chung will face their biggest test yet -- prison time -- for storming Civic Square, that led to the eruption of the Umbrella Movement almost three years ago. Wong was sentenced to six months, Law eight, and Chow seven. Because their prison terms are longer than three months, they are ineligible to run for a seat in the Legislative Council for the next five years. 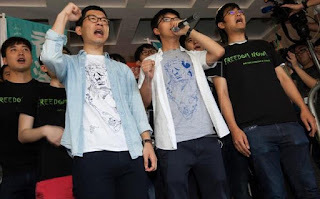 Speaking before the ruling, and expecting to be behind bars, Wong said he wanted to see a "hopeful Hong Kong when I am out [of prison] next year", while Law declared he had no regrets about his activism. While we know the trio are steadfast in their beliefs, are they physically strong enough to deal with prison life? Look at former chief executive Donald Tsang Yam-kuen -- he couldn't even handle two months and he had it really cushy. Nevertheless we're deeply disappointed in the ruling. Wong and Law had already served their community service sentences that were originally handed down by trial magistrate June Cheung Tin-ngan, along with Chow's suspended three-week jail sentence. The trio had testified they stormed Civic Square in the hopes of securing talks with then chief executive Leung Chun-ying over the restrictive framework set by Beijing over how Hong Kong would elect its next leader. Cheung had ruled the case was atypical, and that it called for a more lenient and understanding attitude since the three were young student activists who expressed their demands based on genuinely held political ideals. At the time she said a deterrent sentence would not be fair. However, the Hong Kong government wasn't satisfied with the punishment meted out and demanded a judicial review of the sentences, with prosecutors saying they were too lenient and sent the wrong message to young people. Do those sentences send the wrong message? Are they too lenient? Or do they reveal the government's intentions to bend the law however it sees fit to punish those who try to defy it? The three will already be punished for life anyway -- they cannot go to the mainland to travel or work, they will never be able to get a proper job in Hong Kong. Financially they are already stymied and they are less than 30 years old. The government seems heavy-handed in this case, but it's meant to send a warning to others who may think they can take the trio's place to continue the fight. 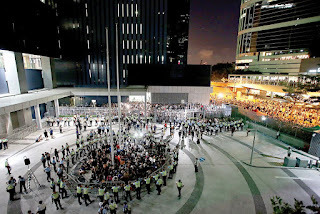 "The freedom of assembly is never absolute," wrote Wally Yeung, a vice president of the Court of Appeal, who added the court must uphold the importance of public order even though "sentencing ambitious, idealist young people to immediate imprisonment" was not a judgment he made "readily". Then why did the trio of judges decide on these sentences? Fellow protest leader Lester Shum says the three plan to appeal their sentences. On Twitter Wong posted this message soon after his sentence: "They can silence protests, remove us from the legislature and lock us up. But they will not win the hearts and minds of Hongkongers."